Falls Church Dinnanigans (Pt. 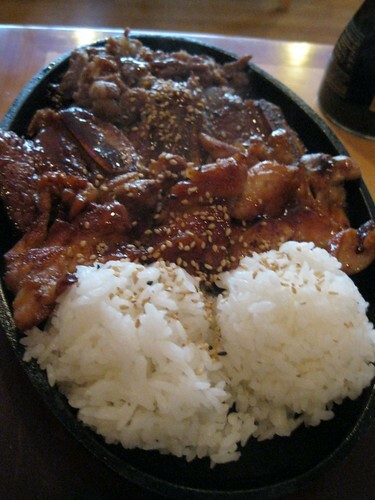 1) | Hapa...Shot the Food! After a long day helping to run a leadership conference and academic tournament at George Mason University, we went out to dinner. 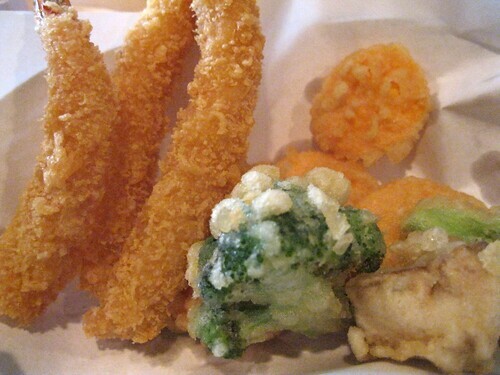 At first we wanted to try a place Kechara had seen on Triple D: La Caraqueña. It turned out we needed a reservation (We had dinner there the next day, which will be in part 2). 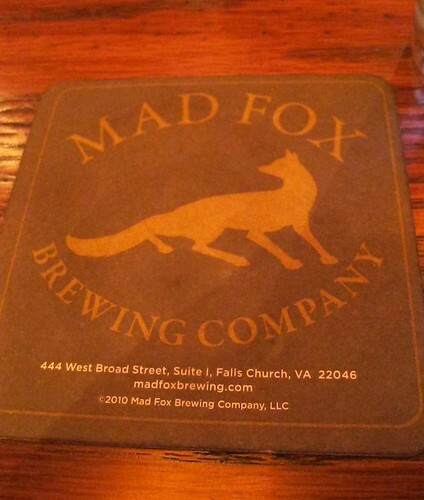 We walked about a block or two, and happened upon a gastropub, Mad Fox Brewing Company. Unfortunately for us, it was busy at the time; a long wait for our large-ish party was pretty much guaranteed (the quoted wait time was indeed long). Our merry band was hungry, so we moved on to another restaurant and pledged to reconvene at the brewery for dinner and dessert. Across the plaza from Mad Fox, was a Japanese restaurant called Koi Koi. It wasn’t nearly as busy, and the food there was tasty. 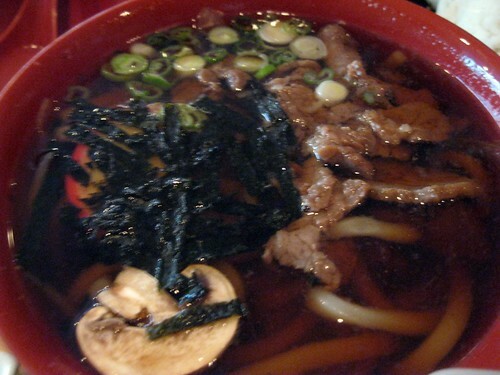 I’m a sucker for udon noodles, so I ordered a big bowl of udon soup with beef. 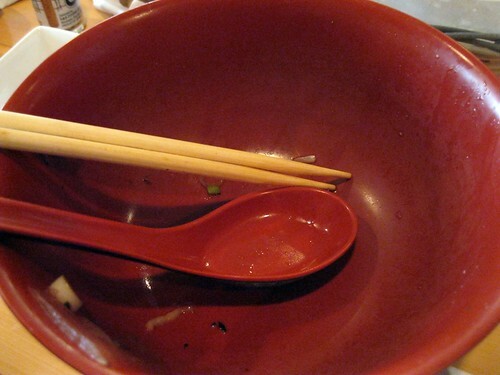 My soup was likely in a miso base and laced with seaweed, mushroom, and scallion. It was a little sweet, but I ate it all up (as you will see in a later shot). 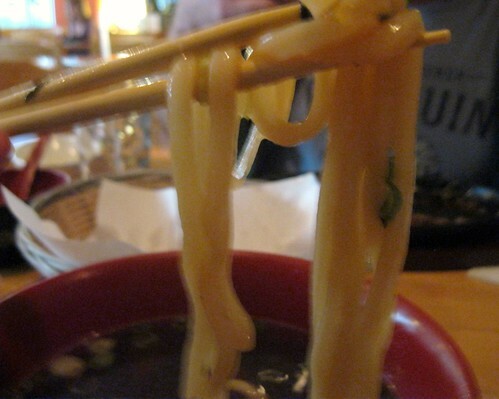 …and I’m making sure to slurp them all up. When we came back to Mad Fox for dessert and drinks, it was a lot less busy. Did you save room? Dessert pictures after the jump. 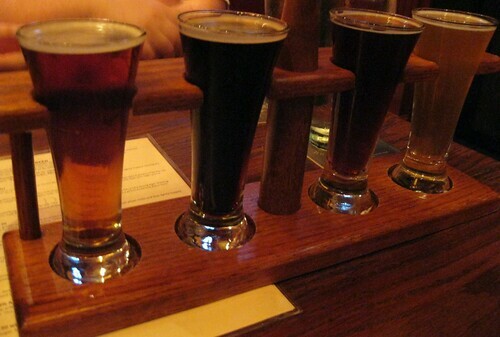 (L-R) Altbier, Irish Stout, The Elixer, Wee Heavy. The Wee Heavy, a Scotch Strong beer, was my favorite. It was full of malty goodness and sweet. 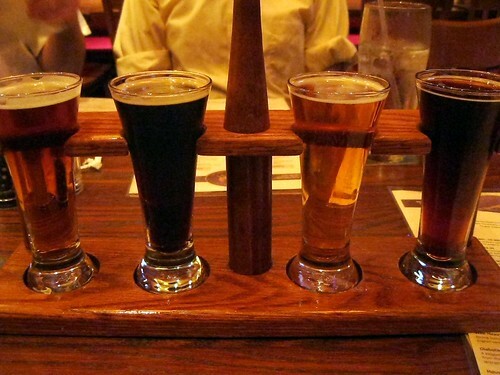 The higher alcohol content was conducive to sipping; just what you want if you want to savor your dessert (beer)! As for (most of) the rest: The stout drank like coffee, while I felt the elixer was light and a little sweet. …And now, the more “traditional” desserts (Hey, beer and pork belly can be dessert!). 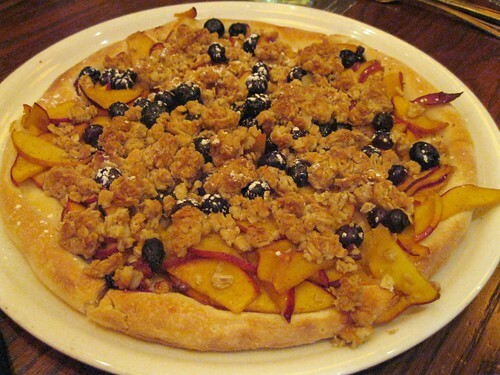 I liked the fruit and streusel; Mad Fox’s commitment to fresh ingredients shone here. I wish it wasn’t on such a dense dough crust; I’d think phyllo dough or puff pastry would suit it better (maybe even thin crust?). The Birra Misu was really cute! The ladyfingers were soaked in the Wee Heavy. 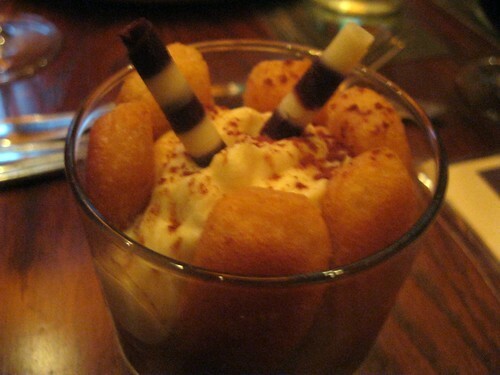 The rest was comprised of standard tiramisu ingredients, save for the rolled chocolate garnish. Two of us had the root beer float. 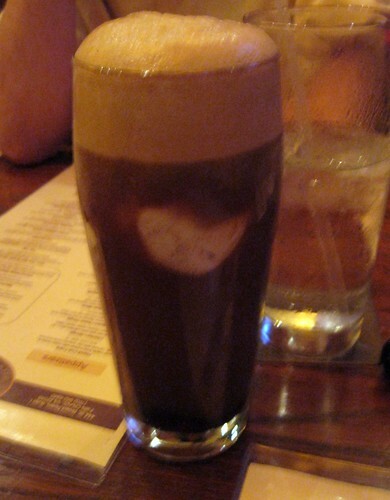 I kept the shot of the one that had a chunk of ice cream floating mid-drink. 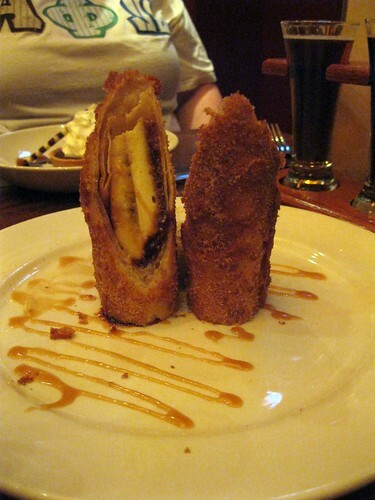 SPFfy and Kechara shared the Fried Nutella and Banana Cheesecake; it looked like a dessert egg roll. It was actually wrapped in a flour tortilla and dipped in a batter made of their Kölsch. 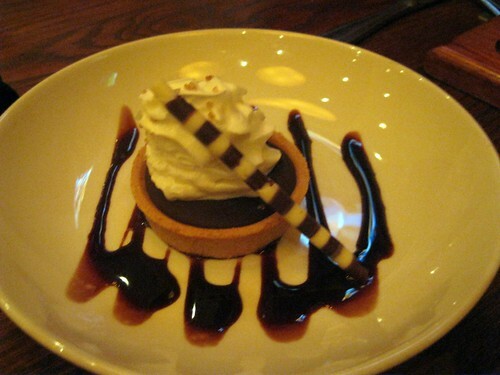 We were told by the (very friendly) waitress that the Chocolate and Caramel Tart was small, but really rich. I’d definitely believe her on that count. 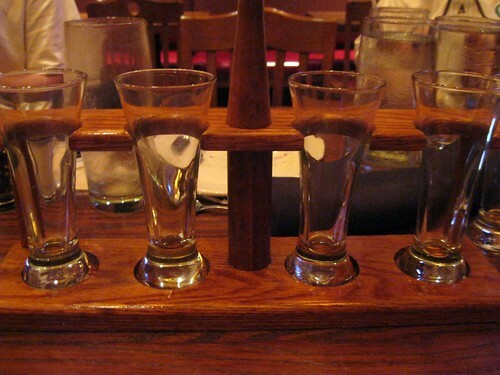 I would have gone for this if I wasn’t planning on sticking to just my beer sample flight. Yep… I finished my flight. Even after trying four types of beer, I didn’t run afoul of AMA guidelines defining moderate drinking (heh). We, like many patrons and staff of the gastropub that night, watched the CONCACAF Gold Cup finals (Unfortunately, I didn’t get a good shot of any of that). I got a shot of these brew tanks as we were heading out. 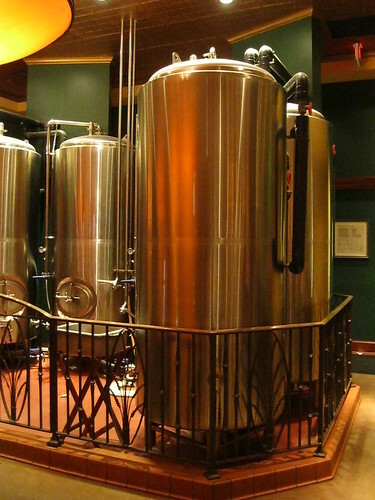 These greet you as you enter the gastropub; I would have been remiss if I didn’t get a shot of those shiny, gleaming tanks. 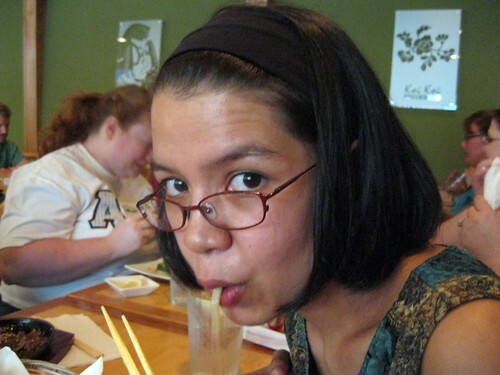 Posted on July 1, 2011, in desserts, eating out, Japanese, Uncategorized and tagged beer, Virginia. Bookmark the permalink. 1 Comment. Two of my favorites. 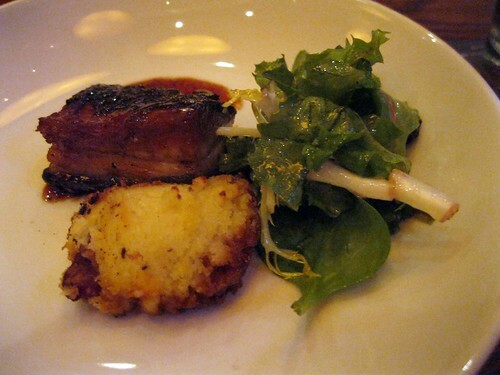 Do try to have a proper meal at Mad Fox. Try the fried green tomatoes for an appetizer. They’re fantastic! ARH: Fried green tomatoes. Be still, my Deep-Southern expatriate heart…thank you!